This activity contains 15 pages of various animals. They are divided by the colors of the rainbow. 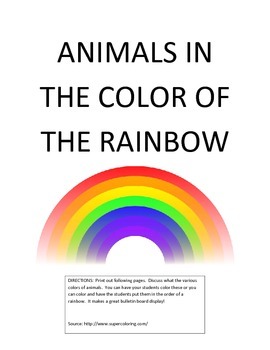 Discuss what the various colors of animals. You can have your students color these or you can color them. Have your students paste them in the rainbow shape (make sure it is the correct order). If you enlarge, it makes a great bulletin board display!